Thermoforming is a universal term for different thermoforming processes, such as vacuum forming and pressure forming. All pressure formers are vacuum form, but not all vacuum formers can pressure form. Have we confused you yet? Vacuum forming uses only vacuum to pull a thermoplastic sheet against a mold, whereas pressure forming leverages both vacuum and positive pressure to form the material against the mold. The differences among these processes are detailed below. Thermoforming: shaping a thermoplastic sheet by the use of heat and pressure. Vacuum Forming: a thermoforming process where a thermoplastic sheet is heated to a bendable state, using controlled temperature, then pulled against a three-dimensional mold, by vacuuming out air between the plastic sheet and the mold. 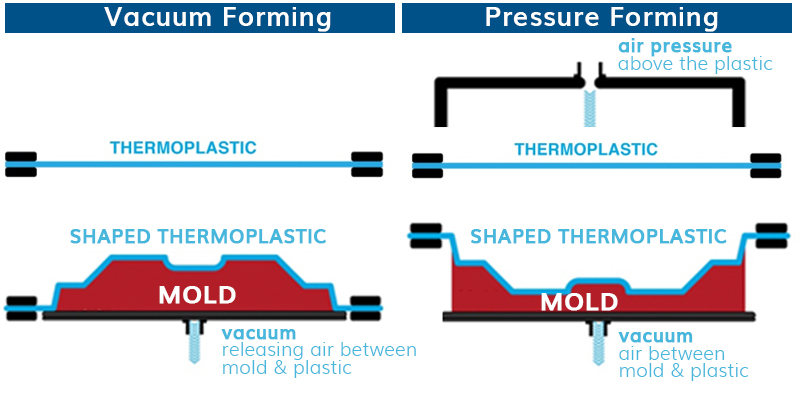 Pressure Forming: a thermoforming process where a thermoplastic sheet is heated to a bendable state, using controlled temperature, then pressed against a three-dimensional mold, by simultaneously vacuuming out air between the plastic sheet and the mold and applying air pressure above the plastic. You don’t need to be an expert, we are. Still not sure what process is best suited for your packaging project? Contact one of our packaging experts today to discuss your next project!